Robert Müller’s drawings are a marvelous exploration of many layers of passages. Passages in time, through several historical epochs. Passages in place, through different spaces. All these layers are printed in the same fine line thickness on light paper giving the work a special elusiveness, which to a great degree contributes to its character by insisting on our concentration and solicitude. Due to the consistent line thickness, it takes time to find and understand each individual layer. The perception of the drawing becomes a process in itself, a journey back through the rendering process. Robert Müller convincingly proves that there is no contradiction between the use of new technology and a sensual presence. Julian Busch from Germany will receive the 2nd prize. The 3rd prize is shared by three submissions; Julie Huang Jahn, Barnabas Wetton & Chris Thurlbourne, all from Denmark, and Clemens Helmke & Dorothée Billard, Germany. 25 submissions from Denmark, Sweden, Norway, Germany, Austria, Great Britain, USA, New Zealand and Japan are exhibited in Hasdorffs Hus from 21 August to 14 September. Hasdorffs Hus is located at Kongens Nytorv 3-5 in Copenhagen. The exhibition is open Tuesday-Friday 2 pm-8 pm, Saturday-Sunday 12 pm-6 pm, closed Monday. Free entry. Today a special issue of Arkitektur DK will be published about the drawing competition. In 2001, the privately founded Henning Larsen Foundation was established by architect Henning Larsen and since then prizes have been awarded each year on the founder’s birthday, 20 August. 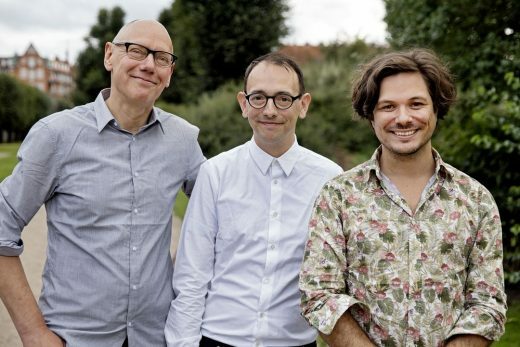 The members of the jury were architect and Professor Henning Larsen, painter and graphic designer Jes Fomsgaard, artist and Professor at the Royal Danish Art Academy Thomas Locher, architect Merete Ahnfeldt-Mollerup and architect Lars Steffensen.